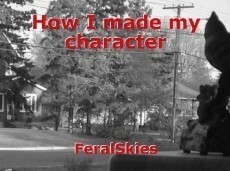 The, one and only, how I made my character. In a large, grey room, sat a chair. Out of nowhere, a voice appeared. "Hmm, time to add something to my collection." Out of nowhere, a clay ball appeared. Seemingly invisible hands shifted the clay and coloured it, into a human boy, around 15. The boy had light brown hair, yellow eyes, and some strange, sharp teeth that were shown when he opened his mouth. "Huh?" The figure pondered, it walked around. "What?!" It yelled out, surprised at the voice. "It, take a seat please." The it glared at the walls of the dark room, before sitting down. "Now... Welcome, to my mind! Right now it-"
"Right now he is in the progress of being made. We have to figure out his traits, then name." Figure growled, but sat in the chair. A loud snap filled the room, as it shifted to a diner. "There, fabulous, I say! What will you be ordering?" Figure sat in the chair, his yellow eyes looked around in confusion..
"Oh yeah.. I'll just get pancakes." Pancakes appeared in a plume of smoke in front of the figure. The figure picked up the fork, studying it, then started to eat. "Mm, this is tasty!" Figure exclaimed. "Hmm, while I'm figuring your name, I'll just put these pancakes on regenerate in case you need more." The voice shifted away, leaving figure gorging on the pancakes. Suddenly, the creator brings us viewers to a different room. Lines of hundreds of characters sat, in the front was a black cat with a gun of some type strapped to her back, and a boy around 18 with light brown hair and green eyes. He watched. "..me." The green eyed boy said. The crowd shifted their eyes to him. "..nice ring to it, Vale." The cat said, blinking her cyan eyes. "Boy reminds me of you." Speaker spoke out. "Then it's settled. The boy is Feral. Any questions?" "may I be his brother?" "hm. Sure." Vale could feel invisible eyes looking at him. "it is settled. I'll be gone, then." The speaker brought us back to the diner, only to find the figure groaning. "that's fine. You'll work it off. Anywho, you having a name, and a brother. Your name is Feral." suddenly, they appeared in some woods. an evil laugh sent shivers down Feral's spine. "Now I'll just have to force it from you, so we can get this over with!" An invisible force pushed Feral back. The boy yelped and sat up. "Huh..!" The force continued, before Feral had enough. An earsplitting crack filled the air, the wind shifted into a dark figure looking down at him. Feral's eyes shifted into.. A monster. The snaps were bat like wings, making their way out. Smoke covered the boy. What escaped was a.. No boy, a monster. Soulless pupils with an arched back and a pterodactyl like head, covered with a solid layer of brownish insect like armour, along with deer like feet and long arms that dragged across the ground. "Good. It appears that you have over one form, sadly I'll have to knock you out to prevent it from taking over." The beast fell down in a flash. © Copyright 2019 FeralSkies. All rights reserved.